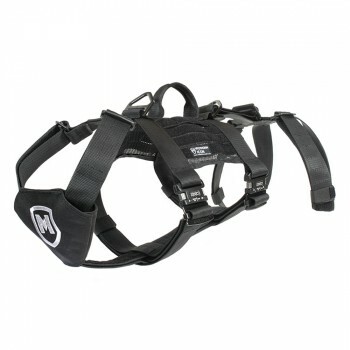 This K9 Rappelling Harness is a unique vertical access platform that is revolutionary in its simplicity, durability and versatility. Designed to meet the strictest requirements for a K9 Rappelling Harness, we took our existing Tracking Harness design and strength rated it to life safety application requirements through a partnership with one of the most respected name in the strength rated industry, TacticalTECH1. Originally designed for SWAT K9 application with vertical access requirements, this design uses the natural anatomy of the canine and extra wide straps to support the dogs torso as well as its hind legs. The rear leg strap assembly ensures that the dog’s hind legs are properly supported to prevent suspension trauma during lengthy vertical applications; while allowing them the freedom of movement necessary for continuous ground application without adjustment or removal of the assembly. The rear leg strap assembly is completely removable, giving the handler the freedom to use the same harness during normal operation and still be able to attach it quickly and confidently because there are little to no moving parts. The harness is assembled using mil-spec 1 ¾” webbing, most commonly used in parachute harnesses, which is quick drying, mold and mildew resistant and strength rated to 7,000 lbs. The body of the harness has been designed to allow the handler to safely lift their dog over obstacles, as well as preventing them from being able to back out of their harness. A V-Ring on the rear of the harness as well as the shoulder blade apex gives the handler multiple clip-in options, and also allows the handler to clip the harness into their chest rig or any raising or lowering system safely. The V-Rings are strength rated to 6,000 lbs and can be clipped with any commercially available attachment option including large diameter climbing carabiners. The 1 3/4″ ISC Whales Klick-Lock buckle provides a secure and redundant attachment point that can be quickly detached but has recessed buttons that prevent accidental unclipping when grabbed at the buckle by the handler or a suspect. The use of Velcro covered Molle on the left and right sides of the harness allows the handler to attach accessories, pouches or affix department or unit identifiers. This harness is sewn to strength rating requirements for rappelling and completely end-user adjustable. We use the same type of webbing the military uses for construction of parachute harnesses throughout the entire harness design which is quick drying, mold and mildew resistant and strength rated to 7,000 lbs. Klick-Lock Buckles are redundant, meaning both sides have to be depressed to release the buckle and the release buttons are recessed which prevents accidental unclipping. Padding at the center of the chest provides comfort and safety for the K9. A second strap secures at the base of the dog's rib cage and an extension from the chest plate keeps it in place. This creates a more stable and safer method of carrying your dog, and keeps the dog from ever backing out of the harness.